So I have been asked to do one of those things where you wonder if you are using a product just for the sake of it to the detriment of taste and perhaps good taste! I have eaten pork cooked in Coke a la Nigella Lawson and it was surprisingly delicious-sticky, spicy and sweet which was perfect with the meat but I’ve never considered putting it in a fruit cake until now. Coca Cola asked me to make Christmas cupcakes for their staff using Coke in the fruit cake recipe so I set about rather sceptically taste testing. Turns out it makes them deliciously moist, slightly more spicy and remarkably tasty ( as my boyfriend just testified!) I don’t think people would be able to guess the secret ingredient but it really does add something to the recipe. I thought that I’d share the recipe as requested so you can try for yourselves. Let me know what you think! This is a fruit cake with a difference. The secret ingredient is Coca Cola! In addition to this it is jam packed with plump brandy and Coke soaked vine fruits and cherries. The glace ginger and walnuts replace the usual mixed peel and almonds and even if I say so myself, it is seriously yummy! It is also cooked for less time than some fruit cakes and the addition of Coke makes it even more moist and sticky. Tip: The real key to making your cakes turn out perfectly every time is to make sure that your tin is lined with greaseproof paper-a ring on the bottom of the tin and one around the sides will ensure that you don’t leave half the cake stuck to the bottom when you turn it out. This recipe will make one round 8 inch cake. Preferably with a mixer but by hand if you don’t have one, cream the butter and sugar together until it is light and fluffy and has changed to a lighter colour. It will take about 10 mins in a mixer or a bit longer by hand. This is really important as it keeps the cake light. Add the beaten eggs a bit at a time mixing after each addition. If the mixture starts to curdle, add a little of the flour. Mix in the treacle to the butter mixture. Sieve together the flour and spices . Sometimes I don’t bother to sieve and it turns out fine. Add this to the butter and egg mixture along with the grated citrus zest and mix thoroughly. Now stir in the soaked fruit and walnuts into the cake mix and spoon into the lined tin. Cook cake on 140C for 2.5 hours. Check to see that the top isn’t getting too brown. Test to see whether the cake is cooked by putting a skewer into the middle of the cake. If it comes out cleanly with no cake mix, the cake is done. Cool on a wire rack. 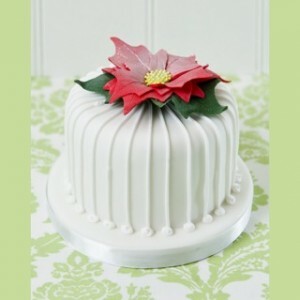 Cover in marzipan and icing and then decorate as creatively as you want.